In the mid-90s, Canada bought the British submarine HMS OSIRIS, for spare parts. The submarine stayed in England for the procedure and was basically stripped of anything that was of value to help us in the spare parts department and then they were shipped to Canada. It included two ASR1 engines, complete with the electrical generator. ASR stands for Admiralty Standard Range. The Royal Navy has large numbers of vessels. 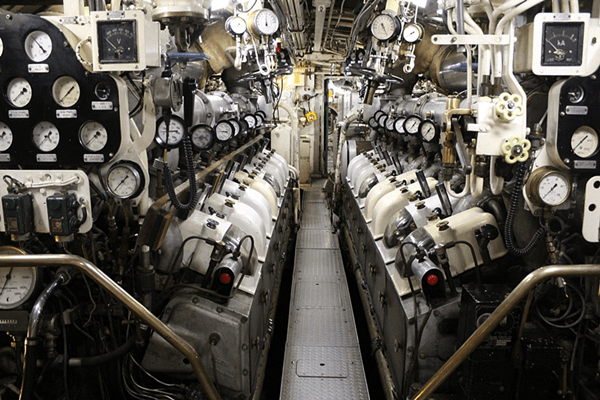 Many years ago, to avoid having to warehouse engine parts of models made by different companies for all these vessels, they decided to design their own engines to standard specifications which would meet the needs of more than one type of vessel. Over the years it was noticed that the area of the engine blocks where the cylinder liners sat was showing signs of corrosion and fatigue. We were fortunate that it could be fixed in situ. But, eventually there was a time when it had to be removed from the submarine. There was only one way out and wasn't through the hatch! A large hole had to be cut in the pressure hull just above the engines, in a section that has always been called the "soft patch." It was a time consuming method adding hundreds of hours to the refit. Now, we had just bought two used diesel engines which came with HMS Osiris, they were sent to a special section in the ICE shop made just for the purpose of getting them ready for Ojibwa. They were stripped down and completely refitted and put back together. Now the problem was how to make the swap - the old for the refurbished. HMS Osiris S13 was an Oberon Class submarine like Ojibwa. She was commissioned into the Royal Navy January 11, 1964. 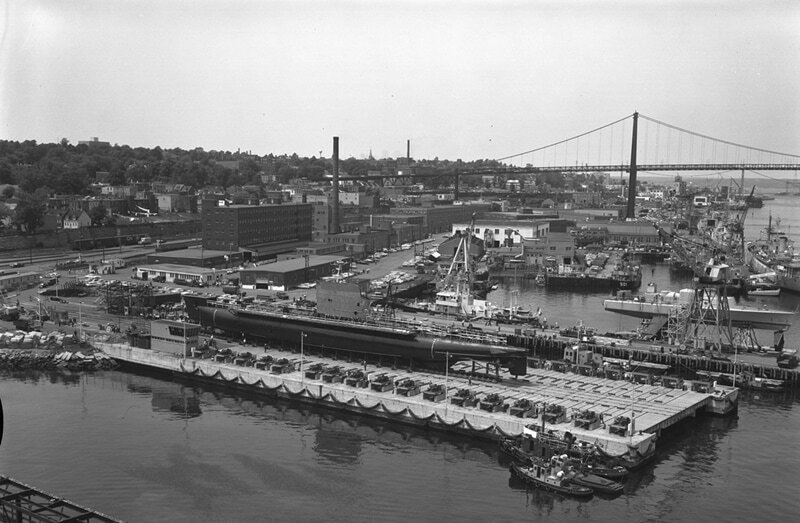 (Ojibwa was commissioned into the Royal Canadian Navy September 25, 1965). Osiris was decommissioned in 1989 and sold to the Royal Canadian Navy for parts. But, will the Idea Float? This is when my section in the dockyard where I worked as a submarine specialist came into play. "Why not cut the submarine in half?" my boss asked me. We could slip out the old engines and slide back in the refitted one. It would save an awful lot of money and time. We had to find a way to cut the hull using unconventional steel cutting methods; that is to cut the hull without heat (since it would distort the hull) and loosing as little steel as possible. After searching and looking around, we found a small company from St-Louis du ha-ha in Québec. They said they could do it without heating the steel and only loosing less than a 1/64th of an inch, using water mixed with garnet at 70,000 PSI. We had earmarked a lot of money for "the cut" since we did not know what could be done and this company would do it for a lot less! So, we started making plans, along with the other departments such as the Naval architects, electrical shop, and so on. We also had to build a massive set of rails to slide the old engine out. Ojibwa being prepared for refit circa 1968 . For more, see below. Then came the time to X-ray the weld; the weld did not show anything on the films. Another X-ray machine was brought in; same result. Why did it did not show on the X-ray films? It simply was a perfect welding job, no flaw, no gas hole, nothing. Hallelujah! We cut two of our submarines in this way. The new Victoria class submarines should not need cutting since their "soft patch" is built-in, and need not to be cut for removal. Time to rest my two fingers! "HMCS Ojibwa was in refit from 16 September 1968 to 5 November 1969. She docked in Synchrolift at the beginning of refit and undocked on 27 June 1969. Her battery was re-installed in October 1969." "I believe this photo was taken in the fall of '68 as she was being towed into position, off the lift, where she would be covered by a plywood and plexiglass temporary shelter for that phase of the refit. We would have already been to NAD to remove the. We would have already been to NAD to remove the batteries and periscopes and alongside the lift to remove the dome and casing. That shelter lasted throughout that lift time until we came off in June 69. The permanent 'synchro' shed was constructed sometime later."